cat eyes & skinny jeans: Get Foxy Bangle Bracelet Giveaway! 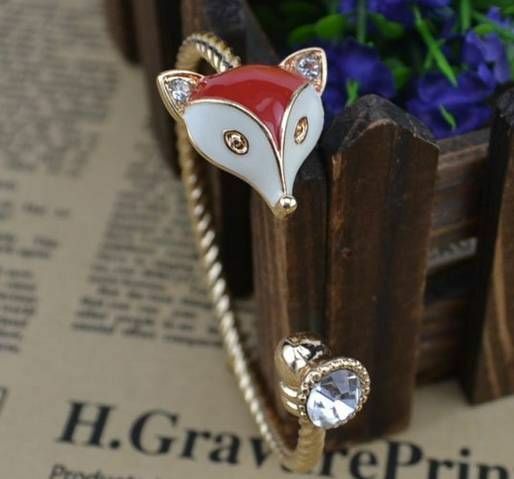 Remember when I introduced you to my AliExpress by Alibaba Fox Face Pendant Necklace a few weeks ago, and mentioned that a fox accessory Giveaway was coming up? Well…today is the day! That’s right, kitty cats! Café Fashionista has teamed up with AliExpress by Alibaba to bring one (1) of you foxy femme fatales a tres chic (and totally on trend!) fall-perfect Fox Face Bangle Bracelet; and more than 40 methods of entry to win! Thanks to AliExpress by Alibaba for the picture. This is so adorable. I love this bracelet. Great giveaway! Sweet giveaway! This looks like an amazing piece. So nice. Wonderful giveaway! What a beautiful bracelet! Really cool giveaway! Love this bracelet. Love your giveaway! I love the Fox stuff! You always have the best giveaways, this is so cute! I love the Purple jade and silver pendant with Dragon. I love all the 'fox' stuff. Wow, incredible giveaway! Very cute bracelet! Good luck to the entrants. Now THAT is an adorable bracelet! Cutest thing I've seen in months!! I love it! The cutest ever! Hi little fox! This watch is super cute! I like the H144 Wholesale Fashion Bracelet Silver Plated Jewelry 13 Charms Tag Chain Link. I like the Women's ring fashion little finger ring Women accessories brief letter pinky ring!